I visited Shanghai for the first time in 2018 and thoroughly enjoyed it. One of the more enjoyable aspects of spending time there is the spectacular show that is the lights and skyline of the iconic financial district across the Huangpu River from the famed “Bund.” Many of the city’s notable hotel properties are located either on the Bund, or within the supertall high rises of the financial district itself. 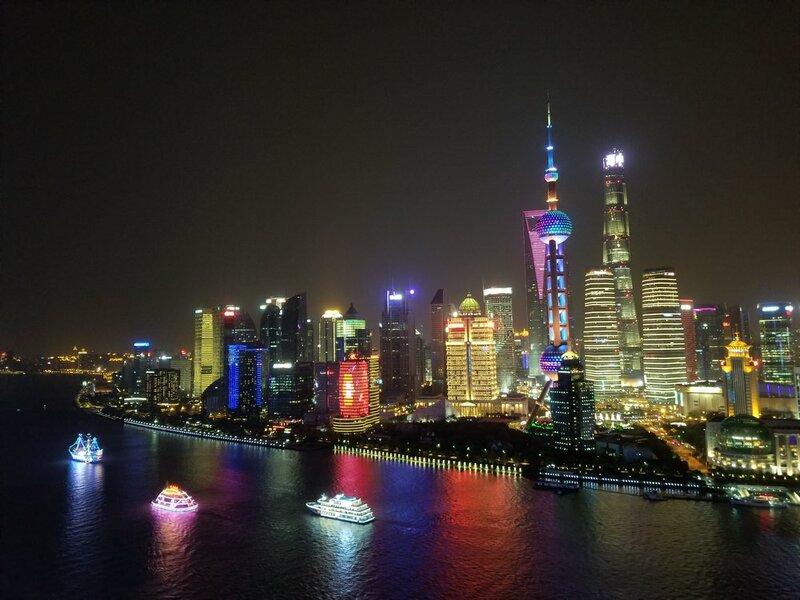 Having never been to Shanghai, I chose to stay in the Grand Kempinski Hotel within the financial district, and just a short walk to the iconic Oriental Pearl Tower, the Shanghai World Financial Center, and the Shanghai tower. One of the first things I discovered was that if you’re staying on that side of the river, there’s really no way to get to the Bund side of the river on foot. Taxis are available, as is the subway, which is what I’d recommend for getting around, but if you’re someone who likes to walk around, you’re going to be more or less stuck on whichever side of the river you originate on. Almost all of the river crossings used by cars are tunnels, none of which have accommodations for pedestrians as far as I could tell. There are apparently ferries that can be used to make the crossing, but I never found these to be convenient based on where I was going, and never was able to give them a try. The lesson I learned was that the subway is a great resource and you should definitely take advantage of it, even if you generally prefer to walk. However, also keep in mind that there is a definite lack of signage in English on the subway system, so you’ll need to rely on recognizing the characters, or as I did, on your internal compass to ensure you’re boarding the correct train. I mostly relied on the subway to cross the river, after which I would resume my journey on foot, so it was fairly straight forward knowing I only needed to go a stop or two in one particular direction. Another interesting wrinkle I encountered was using taxis to get around. Taxis are pretty readily available, but once I was on the Bund side of the river, I found it challenging to find one that was willing to take me back to the other side of the river. I’m not sure if this was simply a coincidence and reflection of my small sample size, or if this was due to the fact that longer journeys yield less margin for drivers, but on several occasions, I found myself unable to get a cab. Then again, very few of the drivers I encountered spoke any English, so it’s also possible that something was simply lost in translation. This can be avoided by simply using the subway, which is by all means quite cheap, quick, and reliable, but I suspect the better solution is to heed the following piece of advice – get a hotel on the Bund. The Grand Kempinski was a fantastic value for money, and did not disappoint on luxury amenities, but its location did end up being inconvenient on a few occasions. One final note on getting around - you can’t download Google maps for offline use, so keep that in mind. There are plenty of apps to fill in the Google maps void. There are certainly plenty of luxurious hotels on the Bund, so you won’t be making any compromises if that’s what you’re after, and although having a room high in the clouds amongst the high rises was great, the reality is that looking at this skyline is probably preferable to staying within it. In fact, on several occasions I sought out particular hotel bars on the Bund because they offered such fantastic views of the skyline. One in particular that I’d recommend is the Vue Bar located on one of the top floors of the Hyatt on the Bund. The bar does have a cover charge, but with it comes a free drink ticket, and of course one of the best views in the city, along with outdoor areas to enjoy nice weather a snap photos. Ultimately, I recall the cover charge exceeding the price of a drink, but it also wasn’t excessive, and probably discourages huge crowds. I found the cover charge to be well worth it, even if all you want to do is take some pictures. Another iconic and well known bar on the Bund is the Long Bar in the Waldorf Astoria. This is a totally different experience from the Hyatt, with pricier drinks and a much more old school vibe. Despite being on the Bund, don’t expect a view from the Long Bar. It’s on the ground floor of the hotel, and is definitely more about single malt scotch in a traditional and luxurious setting – still worth a visit, but for totally different reasons. I was lying about the previous final note on getting around - have to mention the Maglev. The Maglev is a super high speed rail line connecting the airport with the Long Yang road transportation hub much closer to the city center. From Long Yang, you can connect to the subway system, or get a cab to your ultimate destination. I would highly recommend the Maglev, as it is extremely fast and easy to use, but also because there will be zero confusion about which direction you need to go or stop you need to get off at. There is also a subway line which connects the airport to the rest of the system, but it also goes through Long Yang, so I’d probably stick with the Maglev. I would also recommend sticking with metered cabs if you elect to get from Long Yang to your hotel via car. I was approached by a few drivers at the station offering rides to my hotel, but their flat rates were higher than cab fares for the same route.